Looking for fun vintage crafts? 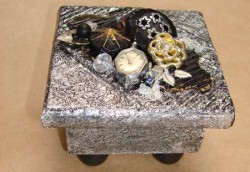 Make a Vintage Look of Metal Box from Heidi Borchers. 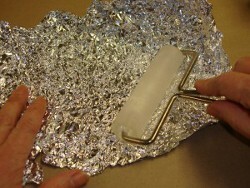 Use aluminum foil to create this awesome craft. Cut and glue the corrugated cardboard to fit the top of the box. 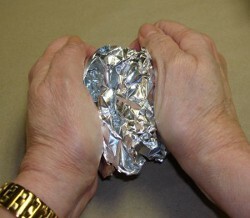 Scrunch the aluminum foil into a loose ball. Don't scrunch too tightly or it will be difficult to get the foil apart. 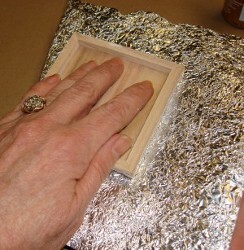 Open up and flatten out the foil….use a brayer to completely flatten. Trim piece to fit the top of box. 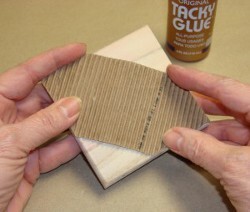 Brush glue onto box lid and over the sides of the box lid. Place foil dull side up on tabletop. Place wood box lid on flattened foil sheet. 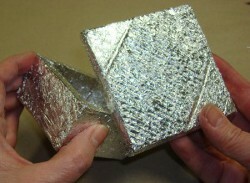 Press and push edges of foil over the top and sides of the box. 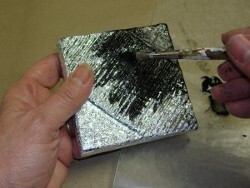 Trim foil when necessary to help foil to fit the top, sides and into the inside of the box. Repeat with the inside of top and the bottom part of the box. 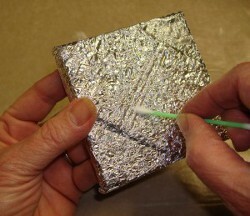 Using a cotton swab, carefully press over the foiled area of the corrugated cardboard, to uncovered the texture. 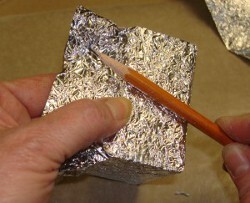 Use the edge of a pencil to press the foil flat against the wood box. 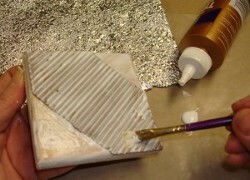 When you are finished, the foil should be flatly glued to the box top and bottom and and you should clearly see the texture design in the foil. Place foiled box onto a sheet of waxed paper. Pour out a small amount of black acrylic paint. 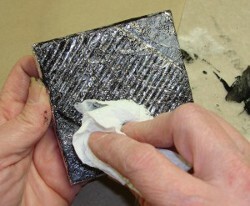 Working on one side at a time, brush the black paint over the foil. Wipe paint back immediately with a paper towel leaving paint in the crevices to highlight the texture and crinkled design. Repeat painting on each side, top and bottom of box. Let paint dry completely. To seal the box, spray with a matte sealer. To decorate the top, paint a torn piece of corrugated cardboard with black acrylic paint. Glue in place on top of box. Decorate with vintage buttons, beads, and unusual collectibles. Paint wooden beads with black paint. Let dry completely. Glue in place on bottom of box. For a video tutorial of this project, check out How to Make Look of Forged Metal with Aluminum Foil Video.